North Michigan Avenue, north of the Chicago River, is one of the world’s renowned upscale shopping streets. But before the Michigan Avenue Bridge was built in 1920, it was known by a different name. 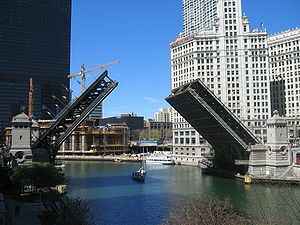 Its name was changed to North Michigan when the bridge connected it with the part of Michigan Ave that lay to the south of the River. Your mission, should you decide to accept it, is to identify the street’s pre-1920 name. a. Streeter Boulevard? b. Emerald Street? c. McLean Avenue? d. Pine Street? e. First Avenue? Enter your selection as a Comment below. I’ll publish the solution in a couple of weeks. This entry was posted on Saturday, March 3rd, 2012 at 8:32 am	and tagged with Chicago, Chicago River, Magnificent Mile, Michigan Ave, Michigan Avenue, Michigan Avenue Bridge, North Michigan Avenue and posted in Transportation, Uncategorized. You can follow any responses to this entry through the RSS 2.0 feed. Thanks for your entry. Very sound logic indeed. Thanks for your entry! The solution will be revealed in two weeks!